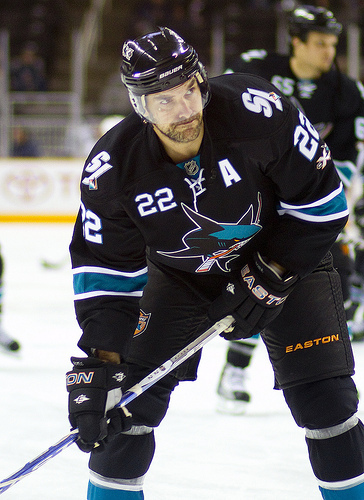 Dan Boyle (Photo by Vu Ching). When the New York Islanders, mighty slayers of the odd inept team last season, announced their acquisition of Dan Boyle last week, there was fairly little comment. No game changing free agent signing, no budding prospect, no bright potential of a possible draftee. Just a useful piece on the power play in Boyle, 38, who will be a free agent in less than a month, for a lousy fifth round draft pick. Try to stifle your yawn. But is this a fair judgement of the value of a late round pick? It was in the fifth round that the Pittsburgh Penguins drafted Jake Muzzin (141st overall). Willie Mitchell, Kings blue liner, was drafted in the 8th round by New Jersey (199th overall). Luc Robitaille, Theoren Fleury – both in the 8th round in their respective years. While the first four picks in 1999 included Patrik Stefan and Pavel Brendl (bracketing the Sedin twins), the fifth round included soon to be free agent Ryan Miller, and Martin Erat, Henrik Zetterberg (heard of him) and Radim Vrbata in the seventh. More recently, 2007 saw Zach Hamill, Angelo Esposito and Riley Nash reeled in with first rounders, while picks from the fifth round on included the before-mentioned Muzzin, Jamie Benn (both in the fifth round), Carl Hagelin and Nick Bonino in round six, and defencemen Carl Gunnarson and Justin Braun in the seventh. Those were just two, randomly selected, years. Now there’s no question that the relative value of picks go higher the closer you get to the first overall. But the question has to be asked – in an era of salary caps and earlier free agency, where parity has every team is looking for the slightest advantage, is there any justification for the idea that ANY draft pick is something other than an important tool to be used in the pursuit of Lord Stanley’s mug? It’s one thing to give up picks for players who can help you in the run for a Cup. Even with St. Louis giving up as much as they did for Miller, and then indicating they’ll make no attempt to re-sign him, while you might quibble about the price, no one will argue that the move wasn’t reasonable. But when the move is to land a player who quite possibly will never play a game for the team giving up the pick, the math starts to break down. One argument, put forward by fellow THW writer Mike Colligan, is that the sacrificed pick gives the acquiring team a leg up on signing the player to a new contract, especially in a less popular market, plus it can allow the team to quickly eliminate the player from consideration and be ready to target other free agents come July 1st. There’s truth in that, but in the era of social media, there isn’t the same issue with multiple teams simultaneously negotiating with the same player as there was when communications involved a phone, fax, or e-mail exclusively. It takes no time at all for an agent to politely tell a prospective suitor to go pound sand, even as he’s debating with five other teams what numbers will come before the six or seven requisite zeros. Ultimately, if a team is serious about winning, it needs to be as serious about caring for comparatively minor assets like late round picks as for major assets such as first rounders and developing prospects. The team considered the epitome of quality management, the Detroit Red Wings, has husbanded late round picks. Since 2003, the Wings have traded away a total of 13 picks – 5 first rounders, 3 seconds, a third, three fourths, and a seventh. Note the lack of later round picks surrendered. Over the same period, they they brought in 12 – 6 seconds, a third, a fifth, and 4 sevenths. On three occasions, they traded a first for multiple later picks – once a first for a pair of seconds, once a first and fifth for a pair of seconds, and the other time was a first for a second and a third. The results have been varied, the only real loss being the 2004 pick, surrendered in a deal with the Capitals which netted Robert Lang. The Caps then used it to draft Mike Green. But the point here is that the Wings have recognized that, apart from the first few picks, the draft is in large part a crap shoot. As such, quantity of picks is more important in many ways than quality – or as Stalin is said to have put it, “quantity has a quality all it’s own” – if combined with a strong scouting staff (which is another article altogether…). And if that is indeed the best way to run a team, then this is a bad deal on the part of the Islanders.